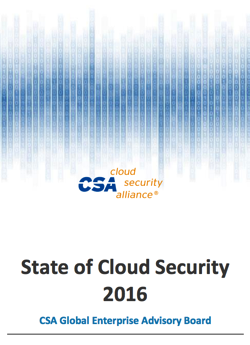 The State of Cloud Security 2016, published by the Cloud Security Association Global Enterprise Advisory Board, is a short, but interesting document, focused on articulating the gaps in current cloud security practices to help cloud providers better understand the needs of their customers. Cloud computing is an incredible innovation. While at its heart a simple concept, the packaging of compute resources as an on demand service is having a fundamental impact on information technology with far reaching consequences. Cloud is disrupting most industries in a rapid fashion and is becoming the back end for all other forms of computing, such as mobile, Internet of Things and future technologies not yet conceived. As governments, businesses and consumers move to adopt cloud computing en masse, the stakes could not be higher to gain assurance that cloud is a safe, secure, transparent, and trusted platform. Cloud computing adoption is solid and increasing. Security and compliance can be adoption barriers. Now is the time to increase the pressure on cloud providers to build security in, not try to bolt it on as an afterthought. We need to take a hard look at many of our existing security practices and retire them in favor of new “cloud inspired” approaches that offer higher levels of security. Both enterprises and cloud providers need to work together to better align their security programs, architectures and communications. Let’s work together to conquer these tough challenges. 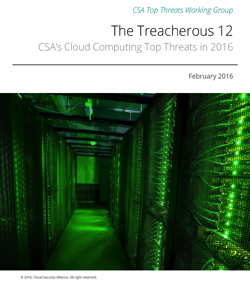 This afternoon, I read the Cloud Security – 2016 Spotlight Report, presented by CloudPassage. It was an informative report based on responses from a Linkedin security community. Aside from the insight it provided about Cloud Security, I found it intriguing that social media groups are proving to be a valuable source of market information. Security of critical data and systems in the cloud remains a key barrier to adoption of cloud services. This report, the result of comprehensive research in partnership with the 300,000+ member Information Security Community on LinkedIn, reveals the drivers and risk factors of migrating to the cloud. Learn how organizations are responding to the security threats in the cloud and what tools and best practices IT cybersecurity leaders are considering in their move to the cloud. It is no surprise that security is a key concern. I would expect such a response from a self proclaimed information security community. 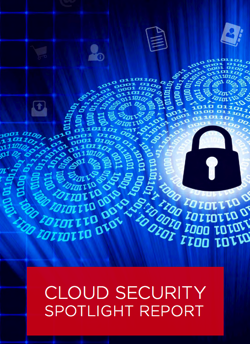 Cloud security concerns are on the rise. An overwhelming majority of 91% of organizations are very or moderately concerned about public cloud security. Today, perceived security risks are the single biggest factor holding back faster adoption of cloud computing. And yet, adoption of cloud computing is on the rise. The overwhelming benefits of cloud computing should drive organizations and security teams to find a way to “get cloud done”. This is a prime example to where security can have a profound impact on enabling business transformation. It was not surprising that most respondents thought that traditional security tools were inadequate. The survey results confirm that traditional tools work somewhat or not at all for over half of cybersecurity professionals (59%). Only 14% feel that traditional security tools are sufficient to manage security across the cloud. I am not a expert on the validity of this type of survey vs. a more traditional survey conducted outside of the social media environment, but I think it provides some valuable insight. There is a lot of work to do, folks! the improved value offered by cloud computing advances have also created new security vulnerabilities, including security issues whose full impacts are still emerging. … and that security is no longer just an IT issue. The 2016 Top Threats release mirrors the shifting ramifications of poor cloud computing decisions up through the managerial ranks. Instead of being an IT issue, it is now a boardroom issue. More vulnerabilities and increased business awareness/responsibility. The urgency of security is rising. The purpose of the report is to provide organizations with an up-to-date, expert-informed understanding of cloud security concerns in order to make educated risk management decisions regarding cloud adoption strategies. The report reflects the current consensus among security experts in CSA community about the most significant security issues in the cloud. British telecom provider TalkTalk reported multiple security incidents in 2014 and 2015, which resulted in the theft of four million customers’ personal information. The breaches were followed by a rash of scam calls attempting to extract banking information from TalkTalk customers. TalkTalk was widely criticized for its failure to encrypt customer data. Praetorian, an Austin, Texas-based provider of information security solutions, has launched a new cloud-based platform that leverages the computing power of Amazon AWS in order to crack password hashes in a simple fashion. Heartbleed and Shellshock proved that even open source applications, which were believed more secure than their commercial counterparts … , were vulnerable to threats. They particularly affected systems running Linux, which is concerning given that 67.7% of websites use UNIX, on which the former (Linux) is based. In June 2014, Code Spaces’ Amazon AWS account was compromised when it failed to protect the administrative console with multifactor authentication. All the company’s assets were destroyed, putting it out of business. The threat is real, folks. Be careful out there!